Since our establishment as the Italian site of Merck Research Laboratories in 2000, we have built an unprecedented track record in drug discovery. Our collaborative efforts have led to the successful launch of four therapeutics currently on the market, and over 25 candidates in clinical trials. As a forward-looking organization grounded in global pharma heritage, high-level R&D expertise is brought to every project through our seasoned leadership team, which oversees all programs. Science is our cornerstone. We leverage our shared enthusiasm for science and our dedication to excellence in order to advance your drug discovery project. Together with our clients, we develop innovative and more effective therapeutics that will improve patients’ quality of life worldwide. 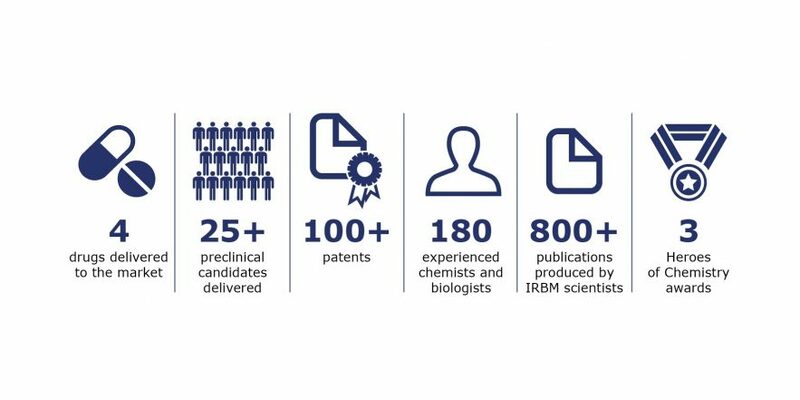 Thanks to our broad expertise, your program can benefit from being developed at IRBM as an integrated project, or by having us support smaller, stand-alone projects. In the case of integrated programs, we will build clear, actionable go/no-go decision points, and employ a first-to-fail approach to ensure your resources are efficiently managed. Every day, our passion drives us to continue to learn, develop, and stay at the forefront of science and innovation. Our partners are our highest priority. Our ardent drug hunters strive to go above and beyond your expectations. We care about the project you entrust in our hands, and will work to advance your program towards the clinic, without sacrificing scientific rigor. We are committed to delivering scientific excellence in all we do, while operating ethically and working on a foundation of trust with our partners. Our scientists are our greatest asset, so we understand the importance of ensuring they are supported, valued and nurtured to maintain a strong, motivated team that can drive innovation. We can accelerate your preclinical drug discovery with our expertise in small molecules, peptides and antibody therapeutics. Our fully integrated solutions and expertise provide you with an enhanced understanding of both the biology and chemistry for your chosen therapeutic. All R&D is carried out under one roof in our state-of-the-art facilities, enabling us to provide seamless transitions between disciplines and faster turn-around times. All projects are matched with a team of highly adaptable scientists and a dedicated project representative to create tailor-made solutions, customized to your evolving needs.